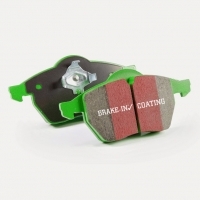 Upgrade pad for Light Truck and SUV improves brake effect 10-20%. Medium dusting factor makes these cleaner pads than stock. Suitable for all light trucks, Jeep and SUV in highway use. Superb brake control and pedal response full grade better than stock. Minimal dusting features makes this a clean pad compound. Features red ‘brake in’ surface coating for instant safe braking after install.